REPUBLIC OF THE PHILIPPINES, PETITIONER, VS. LUDYSON C. CATUBAG, RESPONDENT. Challenged before this Court via Petition for Review on Certiorari under Rule 45 of the Rules of Court are the Resolutions of the Court of Appeals (CA) in CA-G.R. SP. No. 131269 dated September 3, 2013 and December 6, 2013. The assailed Resolutions denied the petition for certiorari filed by petitioner for failure to file a motion for reconsideration. Likewise challenged is the Decision dated May 23, 2013 of the Regional Trial Court (RTC) of Tuao, Cagayan, Branch 11, declaring Ludyson C. Catubag's (private respondent) spouse, Shanaviv G. Alvarez-Catubag (Shanaviv), as presumptively dead. Prior to the celebration of their marriage in 2003, private respondent and Shanaviv had been cohabiting with each other as husband and wife. Their union begot two (2) children named Mark Bryan A. Catubag and Rose Mae A. Catubag, both of whom were born on May 18, 2000 and May 21, 2001, respectively. In 2001, in order to meet the needs of his family, private respondent took work overseas. Meanwhile, Shanaviv stayed behind in the Philippines to tend to the needs of their children. On June 26, 2003, private respondent and Shanaviv tied the knot in Rizal, Cagayan. The marriage was solemnized by Honorable Judge Tomas D. Lasam at the Office of the Municipal Judge, Rizal, Cagayan. Sometime in April 2006, private respondent and his family were able to acquire a housing unit located at Rio del Grande Subdivision, Enrile Cagayan. Thereafter, private respondent returned overseas to continue his work. While abroad, he maintained constant communication with his family. On July 12, 2006, while working abroad, private respondent was informed by his relatives that Shanaviv left their house and never returned. In the meantime, private respondent's relatives took care of the children. Worried about his wife's sudden disappearance and the welfare of his children, private respondent took an emergency vacation and flew back home. Private respondent looked for his wife in Enrile Cagayan, but to no avail. He then proceeded to inquire about Shanaviv's whereabouts from their close friends and relatives, but they too could offer no help. Private respondent travelled as far as Bicol, where Shanaviv was born and raised, but he still could not locate her. Private respondent subsequently sought the help of Bombo Radyo Philippines, one of the more well-known radio networks in the Philippines, to broadcast the fact of his wife's disappearance. Moreover, private respondent searched various hospitals and funeral parlors in Tuguegarao and in Bicol, with no avail. On May 4, 2012, after almost seven (7) years of waiting, private respondent filed with the RTC a petition to have his wife declared presumptively dead. WHEREFORE, the petition is GRANTED. SHANAVIV G. ALVAREZ-CATUBAG is hereby adjudged PRESUMPTIVELY DEAD only for the purpose that petitioner LUDYSON C. CATUBAG may contract a marriage subsequent to what he had with SHANAVIV G. ALVAREZ-CATUBAG without prejudice to the reappearance of the latter. On August 5, 2013, petitioner, through the Office of the Solicitor General (OSG), elevated the judgment of the RTC to the CA via a Petition for Certiorari under Rule 65 of the Revised Rules of Court. Petitioner's main contention is that private respondent failed to establish a "well-founded belief that his missing wife was already dead. WHEREFORE, premises considered, the instant petition for certiorari is DISMISSED. On September 18, 2013, petitioner filed a Motion for Reconsideration, but the same was denied by the CA in its Resolution dated December 6, 2013. Hence, this Petition for Review on Certiorari under Rule 45 of the Rules of Court. I. THE HONORABLE COURT OF APPEALS ERRED IN DISMISSING THE PETITION FOR CERTIORARI ON THE GROUND THAT PETITIONER DID NOT PREVIOUSLY FILE A MOTION FOR RECONSIDERATION BEFORE THE COURT A QUO. II. THE HONORABLE COURT OF APPEALS ERRED IN DISMISSING THE PETITION FOR [CERTIORARI] ON THE GROUND THAT PETITIONER FAILED TO ATTACH THERETO COPIES OF ALL PERTINENT AND RELEVANT DOCUMENTS AND PLEADINGS. III. PRIVATE RESPONDENT HAS NOT ESTABLISHED A WELL-FOUNDED BELIEF THAT HIS WIFE IS PRESUMPTIVELY DEAD. IV. PRIVATE RESPONDENT FAILED TO PROVE HIS INTENTION TO RE-MARRY. In sum, the instant petition rests on the resolution of two issues: (1) whether or not petitioner's resort to a Petition for Certiorari under Rule 65 to challenge the decision of the RTC declaring Shanaviv presumptively dead was proper; and (2) whether or not private respondent complied with the essential requisites of a petition for declaration of presumptive death under Article 41 of the Family Code. Basic is the rule that the nature of the proceeding determines the appropriate remedy or remedies available. Hence, a party aggrieved by an action of a court must first correctly determine the nature of the order, resolution, or decision, in order to properly assail it. Article 41. A marriage contracted by any person during subsistence of a previous marriage shall be null and void, unless before the celebration of the subsequent marriage, the prior spouse had been absent for four consecutive years and the spouse present has a well-founded belief that the absent spouse was already dead. In case of disappearance where there is danger of death under the circumstances set forth in the provisions of Article 391 of the Civil Code, an absence of only two years shall be sufficient. Article 238. 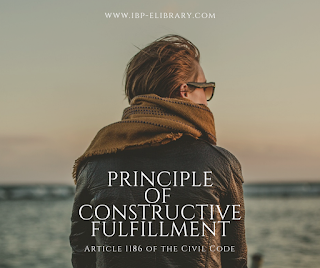 Until modified by the Supreme Court, the procedural rules in this Title shall apply in all cases provided for in this Code requiring summary court proceedings. Such cases shall be decided in an expeditious manner without regard to technical rules. [T]he right to appeal is not a natural right nor is it a part of due process, for it is merely a statutory privilege. Since, by express mandate of Article 247 of the Family Code, all judgments rendered in summary judicial proceedings in Family Law are "immediately final and executory," the right to appeal was not granted to any of the parties therein. The Republic of the Philippines, as oppositor in the petition for declaration of presumptive death, should not be treated differently. It had no right to appeal the RTC decision of November 7, 2001. Further, it is well settled in our laws and jurisprudence that a decision that has acquired finality becomes immutable and unalterable. As such, it may no longer be modified in any respect even if the modification is meant to correct erroneous conclusions of fact or law and whether it will be made by the court that rendered it or by the highest court of the land. While parties are precluded from filing a motion for reconsideration or a notice of appeal, in a petition for declaration of presumptive death, they may challenge the decision of the court a quo through a petition for certiorari to question grave abuse of discretion amounting to lack of jurisdiction. 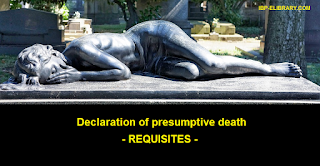 In Republic vs. Sare&ntilde;ogon, Jr., the Court outlined the legal remedies available in a summary proceeding for the declaration of presumptive death. If aggrieved by the decision of the RTC, then filing with the CA a Petition for Certiorari under Rule 65 would be proper. Any subsequent decision by the CA may then be elevated to the Court via a Petition for Review on Certiorari under Rule 45. Considering the foregoing, the Court finds that petitioner's resort to certiorari under Rule 65 of the Rules of Court to challenge the RTC's Order declaring Shanaviv presumptively dead was proper. Having determined the propriety of petitioner's mode of challenging the RTC's Order, the Court shall now proceed to tackle the issue of whether or not private respondent has sufficiently complied with the essential requisites in a petition for declaration of presumptive death. Prevailing jurisprudence has time and again pointed out four (4) requisites under Article 41 of the Family Code that must be complied with for the declaration of presumptive death to prosper: first, the absent spouse has been missing for four consecutive years, or two consecutive years if the disappearance occurred where there is danger of death under the circumstances laid down in Article 391 of the Civil Code. Second, the present spouse wishes to remarry. Third, the present spouse has a well-founded belief that the absentee is dead. Fourth, the present spouse files for a summary proceeding for the declaration of presumptive death of the absentee. In seeking a declaration of presumptive death, it is the present spouse who has the burden of proving that all the requisites under Article 41 of the Family Code are present. In the instant case, since it is private respondent who asserts the affirmative of the issue, then it is his duty to substantiate the same. He who alleges a fact has the burden of proving it and mere allegations will not suffice. Notably, the records reveal that private respondent has complied with the first, second, and fourth requisites. Thus, what remains to be resolved is whether or not private respondent successfully discharged the burden of establishing a well-founded belief that his wife, Shanaviv, is dead. The Court in Cantor, pointed out that the term, "well-founded belief" has no exact definition under the law. In fact, the Court notes that such belief depends on the circumstances of each particular case. As such, each petition must be judged on a case-to-case basis. Furthermore, jurisprudence is replete with cases which help determine whether belief of an absent spouses' death is well-founded or not. A perusal of the cases of Republic vs. Granada, Cantor, and Orcelino-Villanueva reveal the circumstances which do not meet the Court's standards in establishing a "well-founded belief." In Granada, the present spouse alleged that she exerted efforts in locating her absent spouse by inquiring from the latter's relatives regarding his whereabouts. The Court ruled against the present spouse and stated that the mere act of inquiring from relatives falls short of the diligence required by law. It pointed out that the present spouse did not report to the police nor seek the aid of mass media. Even worse, the present spouse did not even bother to present any of the absent spouses' relatives to corroborate her allegations. Similarly in Cantor, the present spouse alleged that she exerted "earnest efforts" in attempting to locate her missing husband. She claimed that she made inquiries with their relatives, neighbors, and friends as to his whereabouts. She even stated that she would take the time to look through the patient's directory whenever she would visit a hospital. First, the respondent did not actively look for her missing husband. It can be inferred from the records that her hospital visits and her consequent checking of the patients' directory therein were unintentional. She did not purposely undertake a diligent search for her husband as her hospital visits were not planned nor primarily directed to look for him. This Court thus considers these attempts insufficient to engender a belief that her husband is dead. Second, she did not report Jerry's absence to the police nor did she seek the aid of the authorities to look for him. While a finding of well-founded belief varies with the nature of the situation in which the present spouse is placed, under present conditions, we find it proper and prudent for a present spouse, whose spouse had been missing, to seek the aid of the authorities or, at the very least, report his/her absence to the police. Third, she did not present as witnesses Jerry's relatives or their neighbors and friends, who can corroborate her efforts to locate Jerry. Worse, these persons, from whom she allegedly made inquiries, were not even named. As held in Nolasco, the present spouse's bare assertion that he inquired from his friends about his absent spouse's whereabouts is insufficient as the names of the friends from whom he made inquiries were not identified in the testimony nor presented as witnesses. The foregoing conduct of the present spouse led the Court to conclude that her efforts in searching for her absent spouse were insincere. Ultimately, the Courts considered these attempts insufficient to comply with the requirement of conducting a reasonable, diligent, and active search. In Orcelino-Villanueva, the Court likewise ruled that the present spouse failed to prove that she had a well-founded belief that her absent spouse was already dead. In said case, the present spouse began her "search" by returning home from her work overseas to look for her missing husband. She then inquired from her in-laws and common friends as to his whereabouts. The present spouse even went as far as Negros Oriental, where the absent spouse was born. Additionally, the present spouse claimed that fifteen (15) years have already lapsed since her husband's disappearance. Applying the standard set forth by the Court in the previously cited cases, particularly Cantor, Edna's efforts failed to satisfy the required well-founded belief of her absent husband's death. Having laid out the foregoing jurisprudential guidelines in determining the existence of a "well-founded belief," the Court now shifts focus to the specific circumstances surrounding the current case. In the case at bar, private respondent first took a leave of absence from his work in the United Arab Emirates and returned to the Philippines to search for Shanaviv. He then proceeded to inquire about his wife's whereabouts from their friends and relatives in Cagayan and Bicol. Next, private respondent aired over Bombo Radyo Philippines, a known radio station, regarding the fact of disappearance of his wife. Finally, he claims to have visited various hospitals and funeral parlors in Tuguegarao City and nearby municipalities. First, private respondent claims to have inquired about his missing wife's whereabouts from both friends and relatives. Further, he claims to have carried out such inquiries in the place where they lived and in the place where his wife was born and raised. However, private respondent failed to present any of these alleged friends or relatives to corroborate these "inquiries." Moreover, no explanation for such omission was given. As held in the previous cases, failure to present any of the persons from whom inquiries were allegedly made tends to belie a claim of a diligent search. Second, private respondent did not seek the help of other concerned government agencies, namely, the local police authorities and the National Bureau of Investigation (NBI). In Cantor, the Court reasoned that while a finding of well-founded belief varies with the nature of the situation, it would still be prudent for the present spouse to seek the aid of the authorities in searching for the missing spouse. Absent such efforts to employ the help of local authorities, the present spouse cannot be said to have actively and diligently searched for the absentee spouse. Finally, aside from the certification of Bombo Radyo's manager, private respondent bases his "well-founded belief&#8221; on bare assertions that he exercised earnest efforts in looking for his wife. Again, the present spouse's bare assertions, uncorroborated by any kind of evidence, falls short of the diligence required to engender a well-founded belief that the absentee spouse is dead. Taken together, the Court is of the view that private respondent's efforts in searching for his missing wife, Shanaviv, are merely passive. Private respondent could have easily convinced the Court otherwise by providing evidence which corroborated his "earnest-efforts." Yet, no explanation or justification was given for these glaring omissions. Again, he who alleges a fact has the burden of proving it by some other means than mere allegations. Stripped of private respondent's mere allegations, only the act of broadcasting his wife's alleged disappearance through a known radio station was corroborated. This act comes nowhere close to establishing a well-founded belief that Shanaviv has already passed away. At most, it just reaffirms the unfortunate theory that she abandoned the family. There have been times when Article 41 of the Family Code had been resorted to by parties wishing to remarry knowing fully well that their alleged missing spouses are alive and well. It is even possible that those who cannot have their marriages x x x declared null and void under Article 36 of the Family Code resort to Article 41 of the Family Code for relief because of the x x x summary nature of its proceedings. Stated otherwise, spouses may easily circumvent the policy of the laws on marriage by simply agreeing that one of them leave the conjugal abode and never return again. Thus, there is a need for courts to exercise prudence in evaluating petitions for declaration of presumptive death of an absent spouse. A lenient approach in applying the standards of diligence required in establishing a "well-founded belief&#8221; would defeat the State's policy in protecting and strengthening the institution of marriage. On this basis, it is clear that private respondent failed to fulfill the requisite of establishing a well-founded belief that the absentee spouse is dead. Thus, the RTC should have denied private respondent's petition for declaration of presumptive death. In fine, having determined the propriety of petitioner's resort to a petition for certiorari and private respondent's failure to meet the stringent standard and degree of due diligence required by jurisprudence to support his claim of a "well-founded belief' that his wife, Shanaviv, is already dead, it is proper for the Court to grant the petition. Consequently, the other issues raised by the petitioner need not be discussed further. WHEREFORE the petition is GRANTED. Accordingly, the Decision dated May 23, 2013 of the Regional Trial Court of Tuao, Cagayan, Branch 11 and the Resolutions dated September 3, 2013 and December 6, 2013 rendered by the Court of Appeals in CA-G.R. S.P. No. 131269 are hereby ANNULED and SET ASIDE. Consequently, the petition of private respondent Ludyson C. Catubag to have his wife, Shanaviv G. Alvarez-Catubag, declared presumptively dead is DENIED. Carpio,[*] (Chairperson), Peralta, Perlas-Bernabe, and Caguioa, JJ., concur. [*] Acting Chief Justice per Special Order No. 2539, dated February 28, 2018. Penned by Associate Justice Amelita G. Tolentino and concurred in by Associate Justices Ramon R. Garcia and Agnes Reyes Carpio. See Bergonia v. Court of Appeals (4th Division), 680 Phil. 334, 339 (2012); Raymundo v. Vda. de Suarez, et al., 593 Phil. 28, 49. Art. 247. The judgment of the court shall be immediately final and executory. 286 Phil. 1079, 1087 (1992). Supra note 22, at 767. Nacuray v. NLRC, 336 Phil. 749, 757 (1997). G.R. No. 199194 February 10, 2016, 783 SCRA 615. See Republic v. Tampus, G.R. No. 214243 March 16, 2016, 787 SCRA 563, 567, citing Republic v. Cantor, 723 Phil. 114, 127-129 (2013); Republic v. Granada, 687 Phil. 403, 413 (2012); Republic v. Nolasco, 292-A Phil. 102, 109 (1993). Republic v. Cantor, 723 Phil. 114 (2013). Republic v. Granada, 687 Phil. 403, 415 (2012). Republic v. Cantor, supra note at 133. Orcelino-Villanueva, supra note 34, at 330. Supra note 36, at 414. Republic v. Cantor, supra note 32, at 114. Republic v. Orcelino-Villanueva, supra note 34, at 327. Republic v. Cantor, supra note 32, at 132. Republic v. Granada, supra note 36, at 414. Orcelino-Villanueva, supra note 34, at 331. Republic v. Cantor, supra note 32, at 132-133. Certification from Bombo Radyo Philippine's Station Manager, rollo p. 75. Republic v. Court of Appeals, 513 Phil. 391, (2005), as cited in Republic v. Cantor. See concurring opinion of Justice Velasco, Jr., supra note 30.